Looks like a couple of Acronyms were left in the Pumpkin Patch over the years. The result looks to have turned it into quite the spooky antenna. Now channeling the spirits of the undead and halloween exclusively, it makes for quite the interesting sight to behold! The Spirit of Halloween Skin can be used on the Arcane Capturing Rod Of Never Yielding Mystery. The trap's stats (power, power bonus, attraction bonus, etc.) are not changed. The Spirit of Halloween Skin may be made available during the annual Halloween event and can be traded on the Marketplace or through Give To Friends. 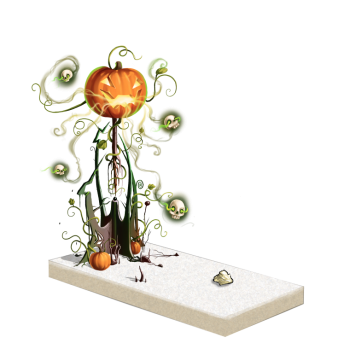 14 October 2014: The Spirit of Halloween Skin was introduced as part of the Halloween 2014 event.. This page was last edited on 9 December 2017, at 15:55.